The world's largest sugar castle will be unveiled Friday. Here we see a last year's castle. Twelve feet of sugar? Yummy. The world's largest sugar castle will be unveiled this week in San Francisco. The Westin St. Francis Executive Pastry Chef Jean-François Houdré is unveiling his signature 12-feet rotating holiday Sugar Castle in the Tower Lobby of The Westin St. Francis on Friday. 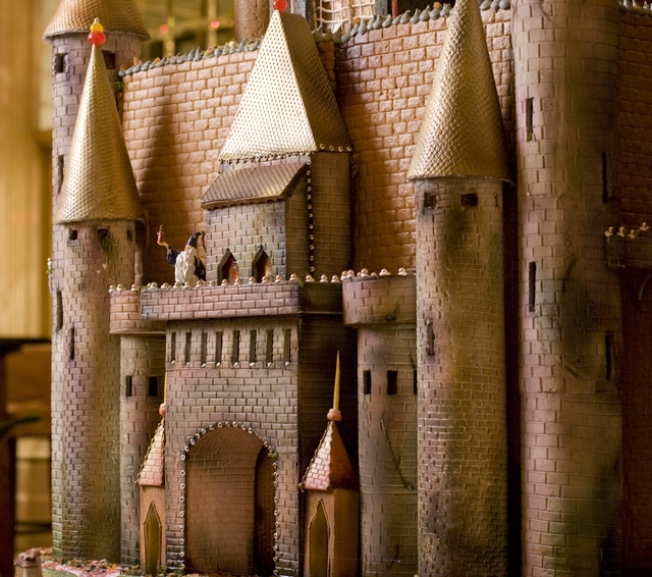 Originally created in 2005, this magnificent Sugar Castle continually grows larger and more spectacular each year. The creation, which resembles a French Chateau, is nearly100 percent edible. The castle weighs over 1,200 pounds and features more than 20 grand circular towers, approximately 30 rooms, illuminated windows and is surrounded by a quaint village and a running train. The castle will go on display on Friday and will run through Jan. 2, 2009.